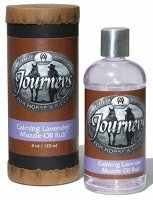 Annie Oakley Perfumery was inspired to create the Journeys™ line after hearing from vets, farriers, owners, and trainers, all looking for supplements to calm horses so they could feel and perform better. I didn’t know animals responded to aroma therapy as well. Interesting, though I personally think the smell of horse and saddle is lovely enough all on its own. Particularly if accompanied by morning dew and meadow grass. Throw in the scent of the barn with all the hay, cats, dust, etc. and it’s deja vu. That’s got to be one of my favorite childhood smells ever. I think the lavender would throw the whole works off for me, but if the horses like it, then I suppose why not? I have the same feelings, A.S. Although, my horse was evil incarnate, and if lavender would have helped, I would have bought it by the truckload. But I love horsey smells, too. As for aromatherapy and animals, wasn’t there that article a while back about the panda who loved men’s cologne? I know that’s not the same thing as aromatherapy, per se, but you know what I mean. Of course, the panda thing would also go to show that our furry friends, like us, have individual tastes. Not every horse may be into lavender. I thought maybe they could use obnoxious zoo-goers for that…..Good fun for the tigers, and respectful zoo-goers like it too! I don’t know enough about horses to comment in any way on this! But the point, I think, is to help calm the horse, not to make anything smell better to humans. Hmmm. I’d wear a “My Friend Flica” perfume if it smelled like lavendar and leather. But I have to second Ab Scentualist’s point: does the smell of lavender do anything for the equine set? When I was a kid, our cat would rub itself on my mom every time she wore one particular perfume. I can’t remember what it was, but she eventually quit wearing it because she hates cats. My mother in law’s cat seems to love milky-sapphron scents, such as C21, and the Zadig & Voltaire. I went to visit her when I was testing them, and the cat got crazy. He, the snobbish don’t pat me or I’ll tear your hand in pieces (he is jealous), became tame as a pelouche and kept looking for me wherever I went. That was strange. And the Z&V was a scrubber. I want to say that I remember Kevin writing about something similar (i.e., kitty going nuts while sniffing his arm) but I can’t remember which perfume did the trick. Mine seems to get all hot and bothered by Feminite du Bois. I think Kevin’s kitty sinked his fangs into his arm due to Yatagan, but I could be wrong. I’m waiting for Rapple to comment… doesn’t she work in both fields (aromatherapy AND horses)? Come out, expert! Yes Rapple – our inquiring minds want to know! Yes she does….but I bet she’s busy –they are in the middle of the big November Sales….last I talked to her she was a bit frazzled. Her job is clearly interfering with her perfume blogging…. She’s baaaaackk….. Boo went straight to the horse’s mouth (get it?) and emailed me, so here I am. Yes, my “day job” is in the Thoroughbred racing industry and, I’ve also been a practicing aromatherapist and done massage/energy work for 15 years now…. so does that qualify me to weigh in? When you’re working with essential oils, it’s not just the “smell” per se, these are volitile oils so these molecules are actually entering the body when you smell them, either through the nose into the brain or by being inhaled into the lungs/bloodstream. As such they can alter mood, decongest sinuses, bronchial tubes, etc. Besides inhaling, the oils are also used in massage, lotions & ungents (the skin is very porous and the essential oils penetrate easily), and baths. It’s interesting that for the most part, people in the Thoroughbred industry are very conservative personally, but when it comes to their horses, they have no problem using homeopathy, aromatherapy, massage and acupuncture – all of which work extremely well on horses! And horse love it! A good friend of mine is a veterinarian, and she had a horse that had been sick and still had some congestion in his lungs. She asked me what to do as physically the horse was ready to race except the congestion. She needed something that wouldn’t be illegal when they tested for drugs. I gave her a blend for a steam inhalation and the horse won its race! She used it for another week, and the horse won its next race. I’ve also had great success with essential oils blended into oil or lotion and rubbed on wounds and injuries in horses. Also, ring worm responds very well to tea tree oil, which is very anti fungal. Sorry for hijacking the blog, Robin! But I hope this answers the questions. If not, email me at rappleyea11 at yahoo dot com. Veedddy interestinck [I was channeling Artie Johnson from Laugh-In if anybody here remembers that?]. Thanks for sharing your expertise Rapple! Not at all…thanks for all the info! I wonder how they determined that horses are calmed by lavender; they just assumed that because people are? I can picture riding through a field of lavender, and having the horse mellow out. No idea…I know nothing at all about horses. Me neither. They probably are as much individuals as humans. Never mind the horses — think I’ll get some of this to spray on my boss! HA — excellent! Let us know if it works. Lol! Agreed! As soon as they make one to calm tantruming toddlers, I’m so there. With kids, it works to put a drop or two of lavender and/or chamomile right on the pillow case. Works wonders! Also, either of these oils are extremely safe to put into a bath, blended first into about a tsp. of vegetable oil. I live right near the stables for the local mounted police, and a couple of the horses have had stress-related problems (one of them was a neurotic gnawer who nibbled the door to his stall to bits). I guess being a cop is a hard job for quadripeds too… I’ll have to mention this to them! Interesting…I’ve really never thought of this before. I’m kind of surprised that no-one’s yet commented on the trademarking of “calming lavender”. Ack…that’s kind of amazing. I didn’t really focus on that. I love the natural smell of horses… don’t know if I’d want to scent them…. but that’s just me. It’s not to make them smell better though, but to calm them down. OK… frag for horses is a shock! But a company names Annie Oakley??? IN MY HEAD, visions of Ethel Merman and Betty Hutton are singing/belting out the vertues of this frag! LOL! They’ve been around for some time, check out the website.